The "Cycle & Recycle 2007" calendar celebrates bicycle as an everyday transportation vehicle, in every season, throughout the world. Included with each month are remarkable color photos of the bicycle as art and utility, captions, and provocative quotations and illustrations. In keeping with its title, the calendar can saves us trees and paper -- it is reusable again in 2018 and 2029, when the 2007 calendar "recycles". Opened and hung, it is 11" x 17". It is a perfect gift for any bicyclist. They make perfect Christmas, Chanukah, Kwanza and Eid al Fitr gifts. The 2007 edition conveys a bicycle culture without borders - from the streets of Rotterdam, London and Cairo, to remote, near mystical, landscapes Mongolia & Peru. This editions centerfold pays tribute to "Meals on Wheels" delivered by bicycle. 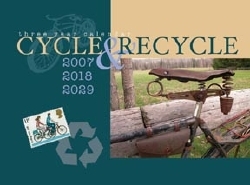 The "Cycle & Recycle" calendar is co-published annually by the International Bicycle Fund and 17 other bicycle organizations from around the world. Proceeds support bicycling. Buy a supply today! Check out the calendar here. * Washington State residents need to add 8.8% sales tax. Within the United States: The prices include postage and handling within United States, to one address. To most of Europe, Caribbean, Central America and selected other countries**: add US$4 per calendar up to 2, for 3-9 calendars add US$9. For postage and handling fees to other destinations contact us. If you have any questions, please contact us. Or, you can pay by credit card and PayPal. To process a credit card we need the account number, expiry date, and full billing address for the card. You can telephone, mail or email the information. For PayPal direct the payment to ibike@ibike.org.